From the Display tab of the Velocity Picking window, you can adjust the display of your velocity picks (i.e. line thickness and colour). As you change the settings in the Display tab, the changes will be reflected in real time in the view. Line Colour — Click on the colourbar to select the colour of the line adjoining your picks. Pick Colour — Click on the colourbar to select the colour of the picks that you have made. Line Thickness — Adjust the thickness of the line adjoining your picks. Circle Radius — Adjust the size of the circle representing your picks. Show on Section — Select this check box to display the picks in section views (i.e. IL/CL View, 2D Line View). Show on Map — Select this check box to display the picks in the Map view. 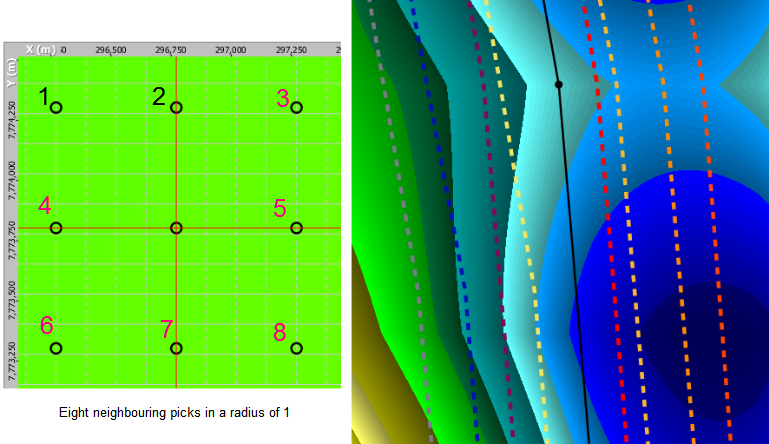 Radius — Define a radius from the point of interest of which neighbouring picks will be displayed. For example, a radius of 1 will display all neighbouring picks in one positive and one negative inline and crossline directions (see image above). Colours -il +il — Click on the left colourbar to select the colour of the neighbouring picks in the negative inline direction, and the right colourbar to select the colour of the neighbouring picks in the positive inline direction. 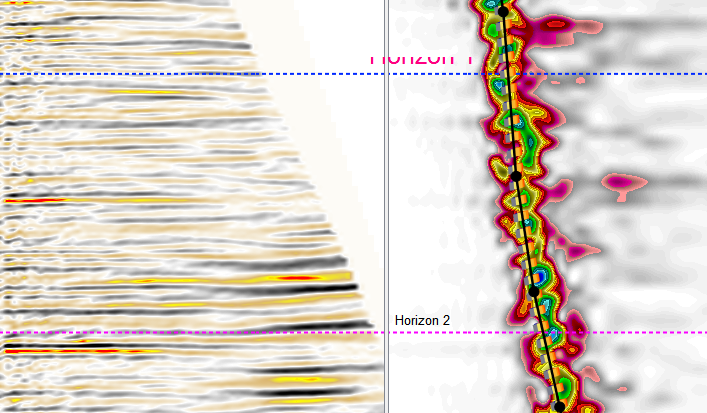 Colours -cl +cl — Click on the left colourbar to select the colour of the neighbouring picks in the negative crossline direction, and the right colourbar to select the colour of the neighbouring picks in the positive crossline direction. Line Thickness — Adjust the thickness of the line adjoining the neighbouring picks. Show interval velocity — Select this check box to display the interval velocity based on your picks. Line colour — Click on the colourbar to select the colour of the interval velocity line. Line thickness — Adjust the thickness of the interval velocity line. 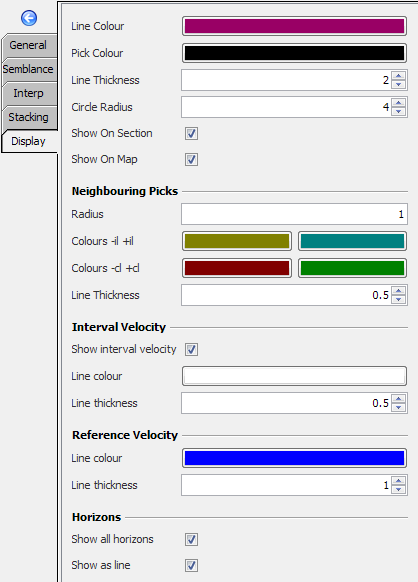 Line colour — Click on the colourbar to select the colour of the reference velocity line. 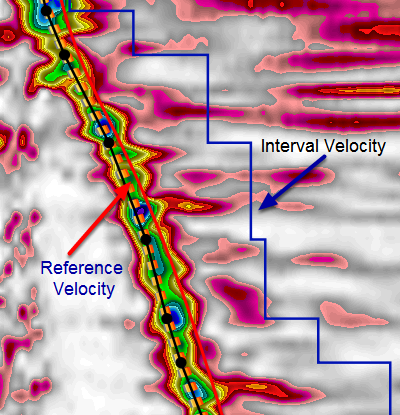 Line thickness — Adjust the thickness of the reference velocity line. Show all horizons — Select this check box to display all the horizons in the view. Show as line — Select this check box to display all the horizons as lines in the view. Clear this check box to display horizon as a single point at the left of each view.